The death scene is really touching and the expressionist landscapes are very pretty to look at but the rest is... boring. It's telling that a film that's barely over an hour long still feels like it's stuffed with filler: the characters are barely developed, and the conflict with the "Sharptooth" felt contrived and forced. Honestly, It feels more to me like the pilot episode to a TV show than a film, and considering they spun off like 20 sequels from this, maybe that was the intention all along. 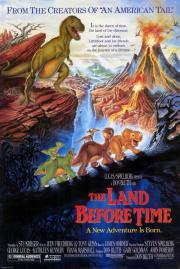 The Land Before Time boasts amazing animation from former Disney alum Don Bluth. The emotion and adventurous storyline will keep the kids entertained. Unfortunately the film is nowhere near up to par with NIMH, and the raw emotion is going to overwhelm the sensitive, children or adult. The only one worth seeing. That triceratops is so annoying it almost makes the entire film unwatchable. I absolutely adore this one, When I was little I'd watch it over and over, and occasionally I'll still rewatch it and it's still good! A film that wrecked kids in the 80's and still holds up today. An animated classic by Bluth, with great direction, excellent animation and a lovely travel story.